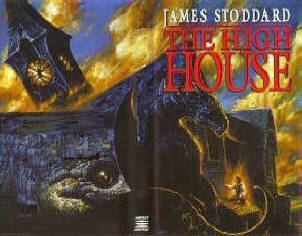 For James Stoddard’s The High House, I have included a picture of the entire book jacket rather than just the front cover. One of the things about this book that makes me happy is the cover art. The notion of a boy and a dinosaur crouching on the eves of a Victorian mansion, the mysterious eyeball peering out from amid the bricks, the old-timey feel, the very askew clock tower, the clashing yellows and blues in the sky: all of it adds up to the best cover illustration that I have ever seen. But if the outside of the book is perfect, the inside of the book is even better. I remember reading this novel for the first time during my sophomore year of college. I had just finished the first four Harry Potter novels and I wanted something more. I was willing to start exploring the adult fantasy, and I did it by grabbing anything at the library that looked interesting. The first couple that I tried, however, were uninspiring to say the least. Then I happened upon The High House, and my world has never been quite the same. What is The High House about? It is about a boy who lives in a magic mansion with dinosaurs in the attic and tigers in the basement. It is about nasty, man-eating furniture with tentacles. It is about a library that turns into a jungle, about a magic set of keys that controls the universe, about clocks that run the planets and lamps that are the stars. It is about characters whose daily motions control the fate of the world. It is about words that give power and oceans that take up indoor rooms. And all of that is just in the first fifty pages. On another level, The High House is the story of a boy who comes of age. It is about his accepting his past mistakes and overcoming them. It is about courage and responsibility and character. It is a story that is at once as old as story-telling and yet ever new. The High House is also about great writing. Luxurious writing, brilliant writing, beautiful writing, writing that fills your soul and swells within you. It is about writing so grand and majestic that it can make even the most bizarre things seem entirely real. The High House is about all of these things and more. Nominally it is classified as “high fantasy” and “young adult lit”, and I supposed in the strictest terms it is those things. Some people have childhood favorites. This book is one of my adulthood favorites. It has everything that great writing should have.